Created by Joshua “Phenetic” Freeman and Jeremy “Onket” Ballard, both of whom are also Drum and Bass DJs, “The American Jungle” music documentary follows the roots of DnB and Jungle, as well as their influences on Electronic Music in North America. Looking back on the past 20 years of Drum & Bass music, it explores how ‘Jungle’ has become a culture as much as a musical genre. It is also the first in-depth documentary to provide an in-depth examination of the history and contributions of current North American ‘junglist’ communities. The music continues to create a loyal fanbase that has remained just below the surface of mainstream recognition. These factors originally drove the producers to draw upon their collective experiences, contacts, and expertise derived from years as promoters and performers in the Jungle / DnB scene to create a documentary experience. The film features interviews with world-renowned DJs, producers, and promoters, such as Dieselboy, Evol Intent, Danny the Wildchild, DB, Andy C, DJ Hype, Dara, AK1200, Odi, Question Mark, Phantom 45 , R.A.W., and Mac of Konkrete Jungle. Narrated by Joshua “Phenetic” Freeman, "The American Jungle" transports viewers to center stage at massive clubs for exclusive interviews set to music by Mason, D-Star featuring Armanni Reign, Divine Elements, Sinistarr, and Legion, to name a few. In early 2017, the film screened in Denver, Chicago, New York, and LA. Associate Producer Keyframe-Entertainment is hosting the San Francisco screening and after party at Public Works. The film will screen in the main room, followed by the after party in the loft, with music by dela Moontribe, Kuze and Shadow Spirit, as well as Jamal, who is also featured in the film. There will also be visuals by FieldFXVisuals and Deco by Props2C. 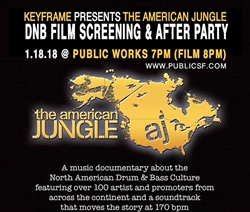 Purchase tickets at: https://www.ticketfly.com/event/1585717-keyframe-american-jungle-sf-san-francisco/ . View the event on Facebook: https://www.facebook.com/events/2054822604748140/ . Created by Joshua “Phenetic” Freeman and Jeremy “Onket” Ballard, THE AMERICAN JUNGLE is an engaging first-person account that tells the story of jungle/drum & bass music and the unique subculture that it has spawned across the United States. Keyframe-Entertainment is the Executive Producer of “ReInhabiting the Village,” “The Bloom Series” Episode 3, and “Electronic Awakening,” as well as the Associate Producer of The Polish Ambassador’s Permaculture Action Tour film, and is currently venturing into Development and Distribution of VR immersive projects.